Two years of experimentation with engines, transmissions, campers, wheels and tires made The Turtle II a great learning experience. 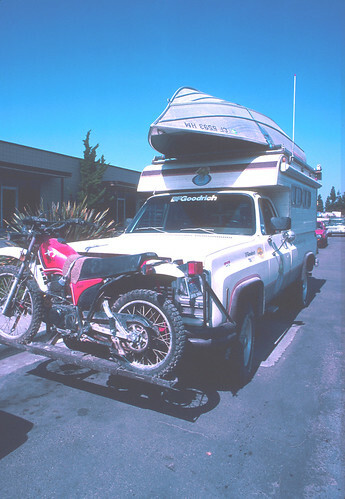 Here, in one of its mid-life configurations, we are headed for some fishing in Baja California. Learning from our mistakes on the Land Rover, we set out to design the Ultimate BackroadTravel/Adventure Vehicle. Based on a Chevy 3/4-ton 4X4 pick-up, we made dozens of modifications to the engine, transmission, suspension and cab. The original 350 V8 was tweaked to a point where it didn’t know whether it was coming or going. Cams, headers, manifolds, carburetors, water injection, and every performance bolt-on item we could find. Mostly, none of it worked. It was still a 350 V8 that preferred high-octane fuel and never got more than 12-mpg fully loaded. Mexican fuel was hopeless. The silt beds along the Pacific Coast of Baja California were a good place to see just how dust-tight a truck and camper were. The Four Wheel pop-up camper did remarkably well. Scrapping the 350, we had Louie Unser build a custom big-block 454 V8, bored to 460, balanced and blue printed. Keeping the compression low, we took the power from the big cylinders in a successful effort to run on low quality fuel, but still never getting much better than 12-mpg. True reliability was still a problem. The truth became apparent. Detroit spends millions of dollars designing engines, and if you think you can do better, you better know what you’re doing!! Economy?? There’s no free ride. This beach near Bahía de Los Angeles showed the advantages of four-wheel drive. Often, it’s the last fifty yards of soft sand that make the difference for that perfect camp. 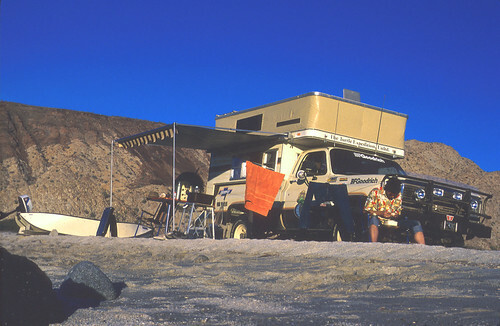 A hand-built custom Callen camper with a portable kitchen, teak interior, boat rack, motorcycle rack and numerous additions took us down the road of some great adventures, but it never had the comfort we were looking for. The Four Wheel Pop-Up Camper seemed to be the perfect solution. Modified to our special needs, we now had a full-stand-up camper with stove, water, sink, refrigerator and a comfortable bed, yet the low profile and light weight retained the mobility we knew we needed to reach the remote backcountry. For all our efforts to outsmart Detroit, about the only addition to The Turtle II that really worked were the Gleason Torsen locking differentials. From a reliability standpoint, we needed a diesel engine and a manual transmission. Ford and International had the answer. The Turtle III was born. 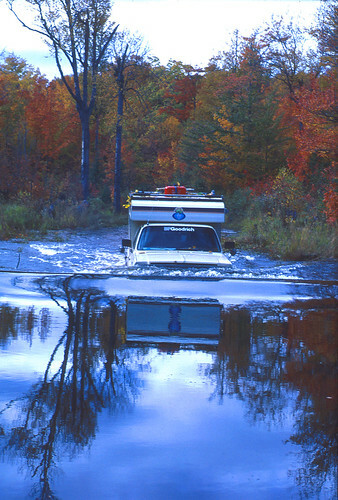 Surprisingly, even crossing deep water like this beaver pond in Michigan’s Upper Peninsula, the engine stayed alive. At one point, the water rolled up onto the windshield. The Eide Automatic Boat Loader gently lowered our 15-foot Gregor Baja Special to the beach at Gonzaga Bay. The side-mounted tire could also swing around and attach to the rear. 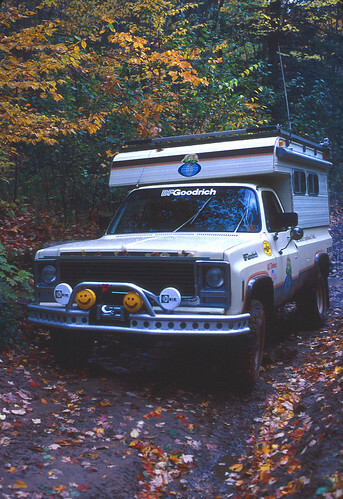 By now we had switched to Clement 16″ steel wheels and BFGoodrich Mud Terrains. Fitted with its original custom Callen Camper, Eide Automatic Boat Loader, and custom motorcycle rack, The Turtle II was ready to map and explore every beach on Mexico’s Pacific coast. The engine in The Turtle II was originally a 350 V8. Everything you could do to an engine to give it more torque, more power, better economy, and the ability to run on poor fuel was done. In the end, if everything had worked like the manufactures said, we would have had a rocket that never needed to be refueled. In fact, after experimenting with headers, cams, manifolds, ignition, carburetors, fuel pressure regulators, air filters, exhaust systems and even water injection systems, it never ran better than the factory stock engine. Our biggest frustration was that competing manufactures couldn’t agree on what worked together. Knowing what the fuel was going to be like south of the border, we gave up and had Louie Unser build a big-block 454, bored out to 460, with the intent of getting the power we wanted from the shear size of the motor, while lowering the compression ratio so it would burn Mexican gas. It worked, and our fuel economy—about 12-mpg—was about the same as with the 350. With the final low-compression 460 cu. in. engine in place, The Turtle II would run on anything. Vapor lock was the only problem we had. Moving an electric fuel pump outside the frame rail, away from the exhaust, solved it. 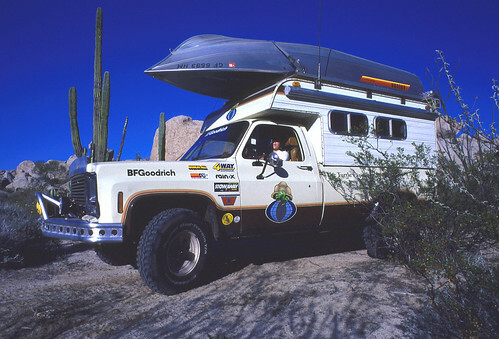 Armed with a Gleason Torsen in the front and a Detroit Locker in the rear, we took The Turtle II into places a big truck with a camper had no business going. Traction we never had with the Land Rover was addictive. The big block was hooked to a custom exhaust system using a Walker flow-through muffler. The stock radiator was retained, with the addition of a flex fan and two Hayden thermo-electric fans in front. Two GNB deep cycle Stowaways were kept charged by a 135-amp heavy-duty alternator. 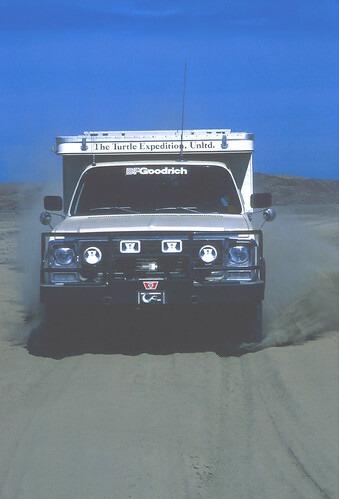 Transmission problems plagued The Turtle II from the beginning. It was an automatic, and after two Art Carr gear boxes failed, we had a turbo-400 built in Chillicothe, MO. After removing all the unnecessary adapter plates and adapting an auxiliary cooler and a B&W shifter, we finally reached a state of reliability—at least as reliable as an automatic can ever be. The front was equipped with a Gleason Torsen which worked like a dream. We swapped the stock rear Corporate for a Dana 60 to make the Gleason work, but it never did, so we ended up with a Detroit Locker. 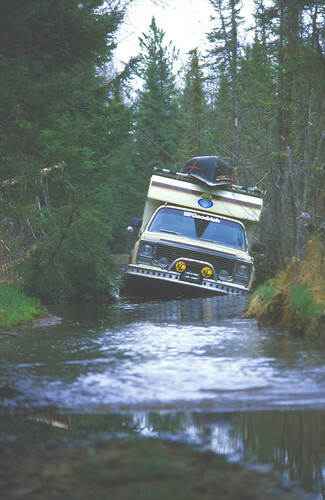 Following side trails in the Boundary Waters Canoe area got us into deep trouble more than once. The Turtle II”s 350 V8 was soon to be replaced with a 454 big block. Drive Line Service of Sacramento kept our Spicer u-joints and other components in top shape. Stock Chevy 3/4-ton with Raybestos pads in front. Massive Dana 60 brakes in the rear. After dumping the original 16.5 wheels, and breaking several Western aluminum rims, we went to Clement steel 16-inch rims and never had another problem. 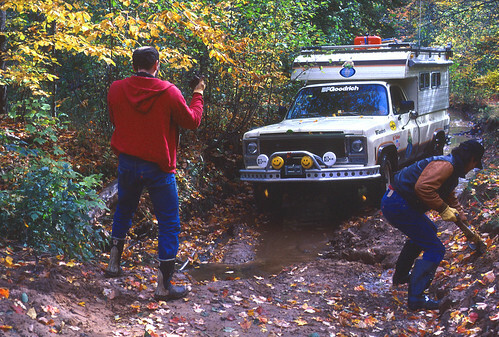 BFGoodrich Mud-Terrain T/As were the first and last tire we ever used. Stock springs were used with Rough Country shocks. The original Holbrecht tube bumper was fitted with a custom motorcycle rack. Later, an aluminum front bumper was designed, and finally, a Rickard Compartment bumper was built. Backroad Touring we called it, and there was no better time or place than Michigan in the Fall. The low profile of the Callen Camper was ideal for this kind of exploring. A custom walnut center console was designed by Jean’s Cabinets. A custom walnut overhead console was designed by Jean’s Cabinets to hold a midland CB and light switches. 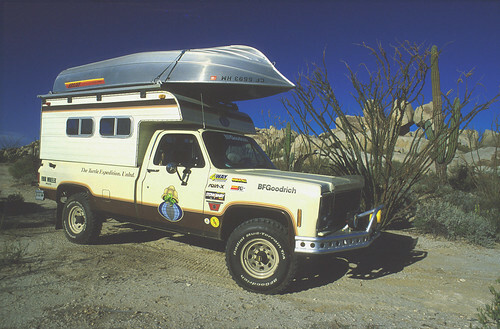 The original camper on The Turtle II was a custom design by Callen Campers in El Cajon, CA. It was a hard side, but not a full stand-up. A custom kitchen could be used inside, but more often it was set outside. An Easy-Load boat loaded carried a Gregor Baja Special, and a rack inside the door held our Evenrude 15-hp motor. 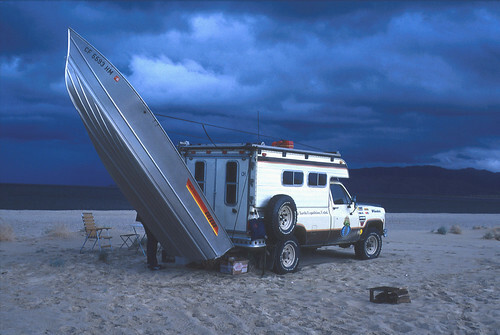 When we saw that the Callen Camper was not as functional as we had hoped, we modified a Four Wheel Pop-Up Camper at the factory in Denver CO, and used that for the remainder of The Turtle II’s life with us. The original Callen Camper we built was compact, but its steel frame was heavy, and it was not a full stand-up design inside. As with many things on The Turtle II, it was very experimental.